The striking ebony finish on the Jayden 4-in-1 Convertible Crib by Da Vinci gives the solid New Zealand a defined and artistic flair. The curved back and soft arcs on the side rails contribute variety of line to the chic molding and dignified pattern of straight horizontal and vertical lines. 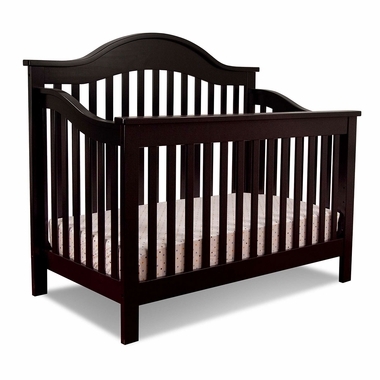 The short front elevation allows you to take your baby in and out of the crib with ease. Use the included conversion kit to turn the crib into a day bed, or add another rail kit, not included, to convert the day bed into a full-size bed that will continue to grow along with your child for years to come. Made of solid New Zealand Pine wood. My husband put the crib together and had a little bit of the trouble with a couple of the parts. The illustrations in the instuction manual were incorrect. Other than that, I'm very happy with the product and the color matches our bedroom set perfectly! I was also very happy to see that it came with the toddler rail since I was getting ready to purchase one which was an additional $60.00.